Frovatriptan is used to treat migraines. It helps to relieve headache, pain, and other migraine symptoms (including nausea, vomiting, sensitivity to light/sound). Prompt treatment helps you return to your normal routine and may decrease your need for other pain medications. 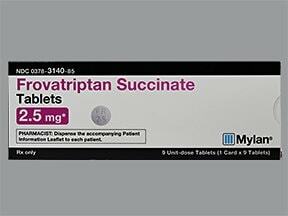 Frovatriptan belongs to a class of drugs known as triptans. It affects a certain natural substance (serotonin) that causes narrowing of blood vessels in the brain. It may also relieve pain by affecting certain nerves in the brain. Frovatriptan does not prevent future migraines or lessen how often you get migraine attacks. Read the Patient Information Leaflet if available from your pharmacist before you start taking frovatriptan and each time you get a refill. If you have any questions, ask your doctor or pharmacist. Take this medication by mouth as directed by your doctor, at the first sign of a migraine. It may be taken with or without food, but may work faster when it is taken on an empty stomach. The dosage is based on your medical condition and response to treatment. If there is no improvement in your symptoms, do not take more doses of this medication before talking to your doctor. If your symptoms are only partly relieved or if your headache comes back, the U.S. manufacturer recommends that you may take another dose after 2 hours, up to a maximum of 3 doses (7.5 milligrams) in a 24-hour period. The Canadian manufacturer recommends that you may take another dose after 4 hours, up to a maximum of 2 doses (5 milligrams) in a 24-hour period. Carefully follow your doctor's directions for using this medication. If you have a higher risk for heart problems (see Precautions), your doctor may perform a heart exam before you start taking frovatriptan. He/she may also direct you to take your first dose of this medication in the office/clinic to monitor for serious side effects (such as chest pain). Talk to your doctor for details. What conditions does Frovatriptan SUCCINATE treat? Flushing, feelings of tingling/numbness/prickling/heat, tiredness, dry mouth, or dizziness may occur. If any of these effects persist or worsen, tell your doctor or pharmacist promptly. Frovatriptan can commonly cause chest/jaw/neck tightness, pain, or pressure that is usually not serious. However, theseside effects are like symptoms of a heart attack, which may include chest/jaw/left arm pain, shortness of breath, or unusual sweating. Get medical help right away if these or other seriousfast/irregular heartbeat, fainting, severe stomach/abdominal pain, bloody diarrhea, signs of a stroke (such as weakness on one side of the body, trouble speaking, sudden vision changes, confusion). List Frovatriptan SUCCINATE side effects by likelihood and severity. Before taking frovatriptan, tell your doctor or pharmacist if you are allergic to it; or if you have any other allergies. This product may contain inactive ingredients, which can cause allergic reactions or other problems. Talk to your pharmacist for more details. What should I know regarding pregnancy, nursing and administering Frovatriptan SUCCINATE to children or the elderly? If you also take any ergotamine medication (such as dihydroergotamine) or other "triptan" drugs (such as zolmitriptan, rizatriptan), you will need to separate your frovatriptan dose at least 24 hours apart from your dose of these other medications to lessen the chance of serious side effects. Does Frovatriptan SUCCINATE interact with other medications? This medicine is a white, round, film-coated, tablet imprinted with "M" and "FR 2.5". 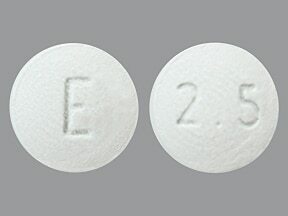 This medicine is a white, round, film-coated, tablet imprinted with "2.5" and "E". 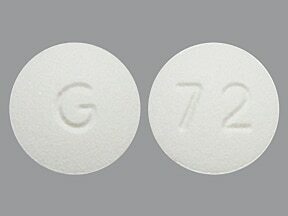 This medicine is a white, round, film-coated, tablet imprinted with "72" and "G". Are you taking Frovatriptan SUCCINATE? Are you considering switching to Frovatriptan SUCCINATE? How long have you been taking Frovatriptan SUCCINATE?